I purchased this knife from the late Robert Bartoli of Brightedge. Bob was a good guy, but had one of those personalities that some people in the kinfe world couldn’t stand. I personally liked the guy a lot, and bought quite a few knives from him. I think I bought a few lights from him too. One of the best deals I got was this guy for $40, which I ended up flipping on ebay for over $100 a couple years later. 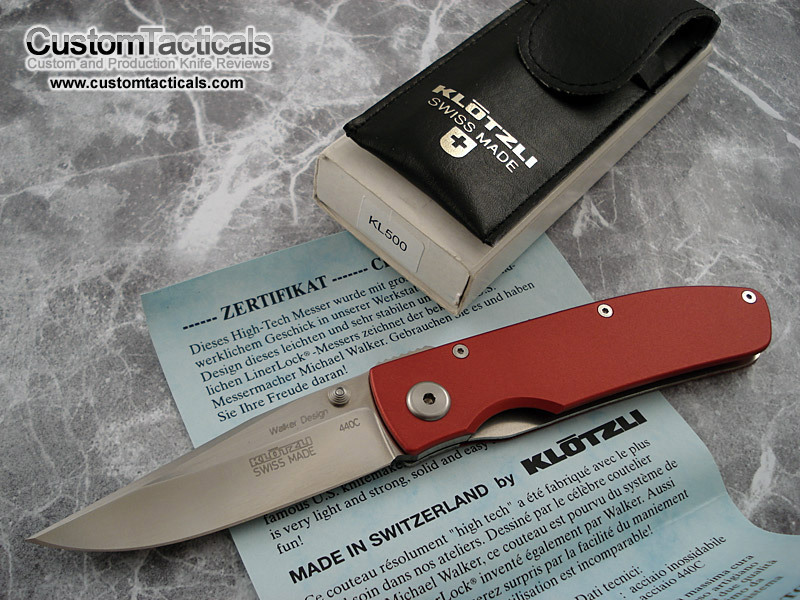 This was the third Klotzli knife that I bought, and probably the least well made of them all. The liners on this model were a bit rough, and not hand finished like the others ones I made. The Swiss make great watches, but their knives aren’t quite as well made as their American or Japanese counterparts in my opinion, though still nice peices of kit. There is only one liner, the side with the lock, and the other side simply has the handle, like all the other Klotzli’s I have owned and handled, though there are some models that are not of this composition. 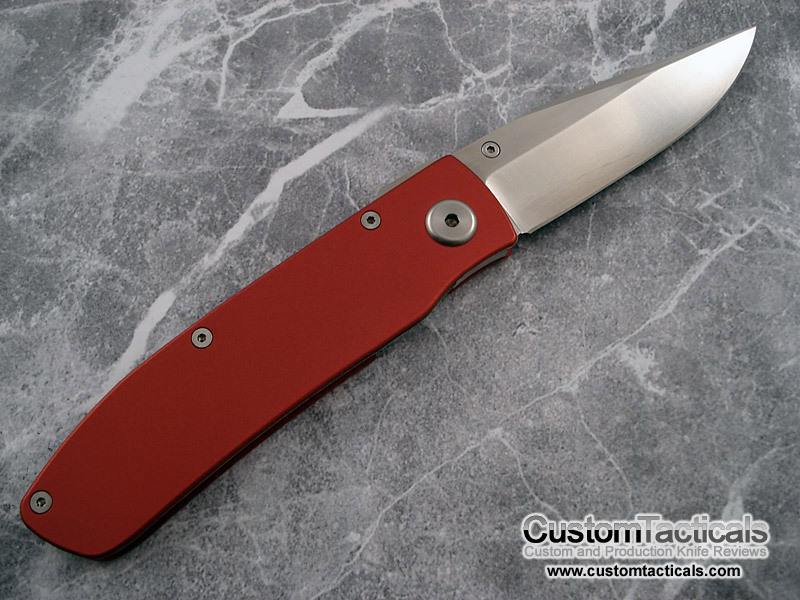 The bright red aluminum handles are annodized and sort of a blasted finish, but not like the fine finish of a Microtech, more of a mini orange peel type finish. 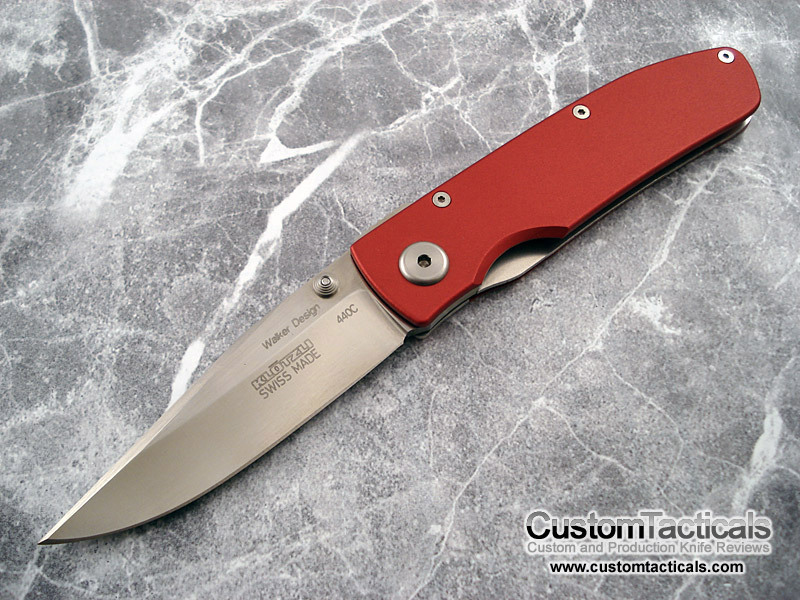 Liner lock is titanium, and blade 440C, which is quite common with Klotzlis. The knife is still very well made, and the blade is ground very nicely. This knife is a Michael Walker design, and is a decent size, bigger than my other Klotzlis at least, with a 3″ blade. No pocket clip, but comes with a little sheath… the sheath is a cheap sort of fake leather material, unlike the higher end Klotzlis that I have, and does not last too long, when it started fraying. Overall, I have liked this Klotzi, and it is very similar to the rest. Can’t complain for $40, right? Its much better than the CRKT knives in the same price range, that’s for sure! Most Klotzlis will cost you much more than $40, however. I do recommend the higher end ones more than this one. I recently had this exact knife confiscated because I forgot to check it at an airport. It was a gift from my father-in-law and I am trying to find a replacement. I can’t find this model for sale anywhere online. Could you suggest anywhere to get one? Hard to find old Klotzli knives now, but eBay might be a good place to get lucky.